Chairwoman of Working People’s Alliance, Tabitha Sarabo-Halley and fellow executive member, David Hinds. 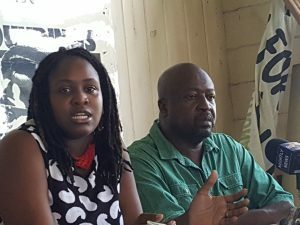 The Working People’s Alliance (WPA) has nominated Tabitha Sarabo-Halley to replace Dr. Rupert Roopnaraine who has resigned from parliament because he is a dual citizen, party sources said Saturday. The senior WPA sources said their executive unanimously reaffirmed a two-year old decision to pick the 31-year old Sarabo-Halley as a means of motivating youths to fulfill political roles and move away from being treated as mere tokens. “We did so because we wanted to signal to the youth population that it is time they play a meaningful role in the coalition beyond tokenism,” a WPA source said. Sarabo-Halley’s name was dispatched to President David Granger two weeks ago. The other contenders were Dr. Rishi Thakur and Desmond Trotman, long-serving WPA party members. “We feel that it is time the young people are prepared to make their own mistakes and we must move beyond lip-service on the involvement of young people. Older people must be prepared to make space for young people,” the WPA official said. There are already murmurings among a number of young leaders of the People’s National Congress Reform about whether the older parliamentarians would step aside in favour of youth participation. About three weeks ago, City Mayor Pandit Ubraj Narine, who is a PNCR supporter, told a youth concert at Parade Ground that the opposition People’s Progressive Party was facilitating young people in leadership positions such as in the City Council. For it’s part, the PPP often compares the ages of its parliamentarians to those on the government benches. The WPA source said Roopnaraine resigned with “the full knowledge” of his party. Two years ago, Roopnaraine had resigned but the President had refused to accept his resignation. On this occasion, President Granger announced that the four dual citizenship government lawmakers—Foreign Minister Carl Greenidge, State Minister Joseph Harmon, Business Minister Dominic Gaskin and Public Service Minister Dr. Roopnaraine—had resigned from their ministerial posts. Except for Roopnaraine, government had said the ministers would remain in office until they submit their resignations from the National Assembly to the Speaker of the House, Dr. Barton Scotland.